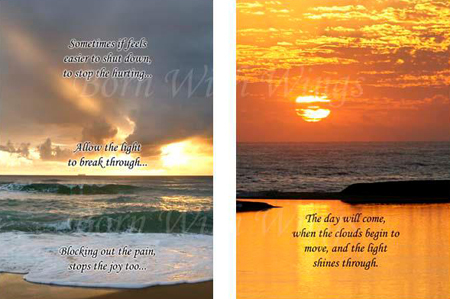 Baby loss journals are spaces for heartache after losing a child. You never get over the loss of a child. It is a continual journey through darkness and light; challenges and changes. When you lose your baby, you're never the same person you were before. 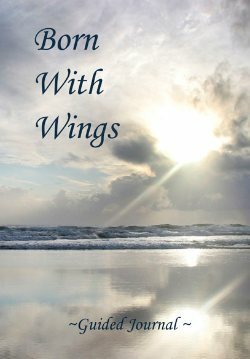 Born With Wings is a Guided Journal for your grief after losing a baby. It helps you begin the daunting process of living without your child. It is a place for you, your anguish, your thoughts, your feelings and your memories. It is a place for your stormy days, your rainy days, your cloudy days... it is also a place for the days when perhaps you suddenly capture a glimmer of a rainbow or when a ray of light and hope starts to peek out from behind those clouds. Here is a place where your soul can speak freely... when it's only YOU who can understand it's language.